Republican governors met with GOP members of the Senate Finance Committee on Thursday to talk about Medicaid, one of the most politically tricky parts of Obamacare repeal. As far as people covered through the Medicaid expansion losing their insurance, "it ain't gonna happen," Minority Whip John Cornyn told reporters. Giving states more flexibility over how the program works is key to any Republican Medicaid efforts. A per capita cap is looking likely, as are much less strict benefit requirements. The GOP's problem: Some Republican governors took the Medicaid expansion, enrolling millions of new people into the program. If the Medicaid expansion is repealed along with the rest of Obamacare, those people would either lose their coverage, or states would have to fork out much more money to keep them covered (the federal government pays for the majority of expansion). The other issue is how, if Medicaid expansion is kept, congressional Republicans get around accusations of unfairly giving some states — expansion states — more money than those who didn't take the expansion. Texas Gov. Greg Abbott, non-expansion state: He thinks what will end up happening is states will receive federal funding through a per capita cap, regardless of whether they have expanded Medicaid or not. States would be able to choose what income level qualifies for Medicaid, in theory meaning states could still expand or choose to lower the income threshold. "A big takeaway I think is that it looks like it's going to be very fair to all states," he said. Cornyn said while per capita caps were discussed, no decisions have been made. Ohio Gov. 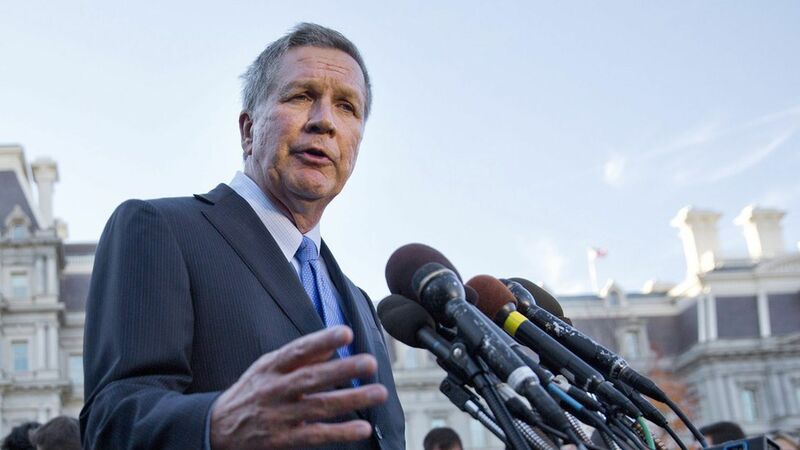 John Kasich, expansion state: Suggested moving the top earners included in the expansion onto exchanges, where they'd receive federal assistance for private coverage. Cornyn called the idea "creative." Kasich told reporters he wants the program to have "guardrails," but currently, "are there some things in that package that if we have flexibility, we wouldn't need to provide? The answer to that is yes." Wouldn't guarantee Ohions wouldn't lose coverage, but he's "down here trying to do my best to make sure that we have a good plan." Utah Gov. Gary Herbert: States need to spend less on Medicaid, and can do so partially by "restricting benefits and limiting some what the benefit packages are...the same is true with restricting the number of people that get on the system." Still unclear: If Medicaid expansion is kept, in some form or another who will pay for it? While cutting benefits will reduce the cost of the program, someone will still have to assume financial responsibility for the expansion population. States are unlikely to want to take that on.